Place your bets and launch the ball to win in this casino favourite. 3D Roulette gives you everything you love about roulette & more. Take a chance today & be the one to live large! Play this game for free with £5 no deposit bonus offered by 888games! So many different betting combinations, so many winning options - spin your win with this fabulous 3D featured Roulette! Select your bet by clicking on the arrows and selecting chips marked 0.1, 0.5, 1, 5, 25, 100. Place your bets by clicking on your desired spot on the board. · Click ‘Double Bet’ to place the same bet on the same spot again. · Click ‘Undo’ to reverse your last action. · Click ‘Repeat Bet’ to place the same bet on the board again. · Click ‘Repeat & Spin’ to place the same bet on the board again and spin. Straight Up: Place your bet directly on any single number. Split Bet: Place your bet on the line between any two numbers. Trio Bet: Place your bet on the intersecting point between 0, 1 and 2, or 0, 2 and 3. Street Bet: Place your bet at the end of any row of numbers, covering three numbers. Corner Bet: Place your bet on the corner where four numbers meet. Line Bet: Place your bet at the end of two streets on the line between them. A line bet covers all the numbers in either street, for a total of six. Dozen Bet: Place your bet in one of the boxes marked "1st12", "2nd12", or "3rd12", each covering twelve numbers. Column Bet: On the right side of the board there are three boxes marked "2 to 1". By placing your chip in one of these boxes, you mark all twelve numbers left to it (excluding 0). Red/Black or Even/Odd: A bet placed in one of the four boxes covers half of the numbers on the board, as described in that box. The zero in not covered by any of these boxes. Each box covers eighteen numbers. Low/High Bet: Place your bet in one of the boxes marked "1 to 18" or "19 to 36", each covering 18 numbers. Four Number Bet: A bet placed at the corner of the intersection of 0 and 3, covering the numbers 0, 1, 2, and 3. Red Splits: Place your bet to cover all red numbers covering the line between two numbers. Black Splits: Place your bet to cover all black numbers covering the line between two numbers. Orphelins: Place your bet on a number and its neighbours making up the two slices of the wheel outside the Tiers and Voisins. This bet covers 17,34,6,1,20,14,31,9. You can also browse over the roulette ring on the board to highlight 5 neighbouring numbers in relation to the actual roulette wheel. Click on them to place your bet. 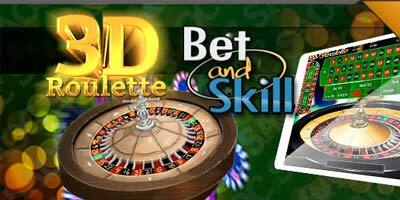 "3D Roulette casino game - No deposit bonus - 5 pound free - How to play - Demo"